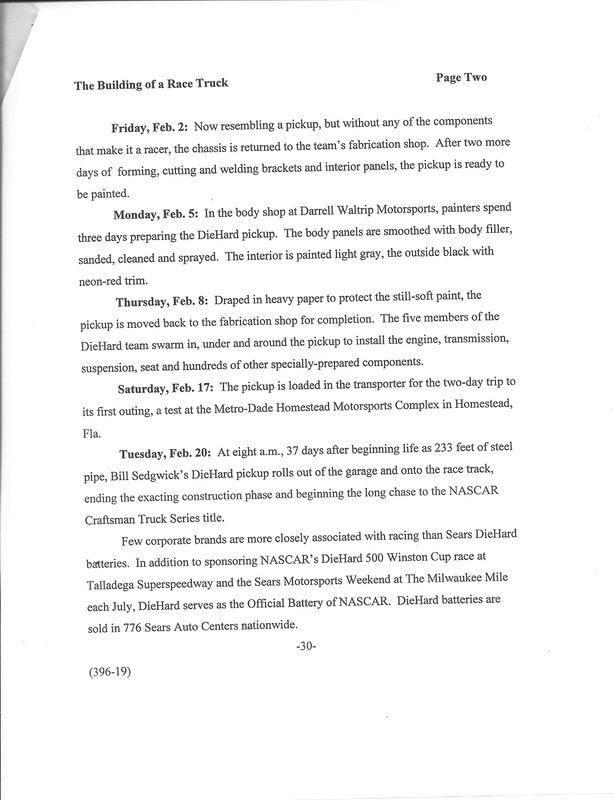 The Driver Suit Blog-“Press Kit” Does NOT Mean Ironing a Uniform! By David G. Firestone Hope you all had a great holiday season, whatever you celebrate. 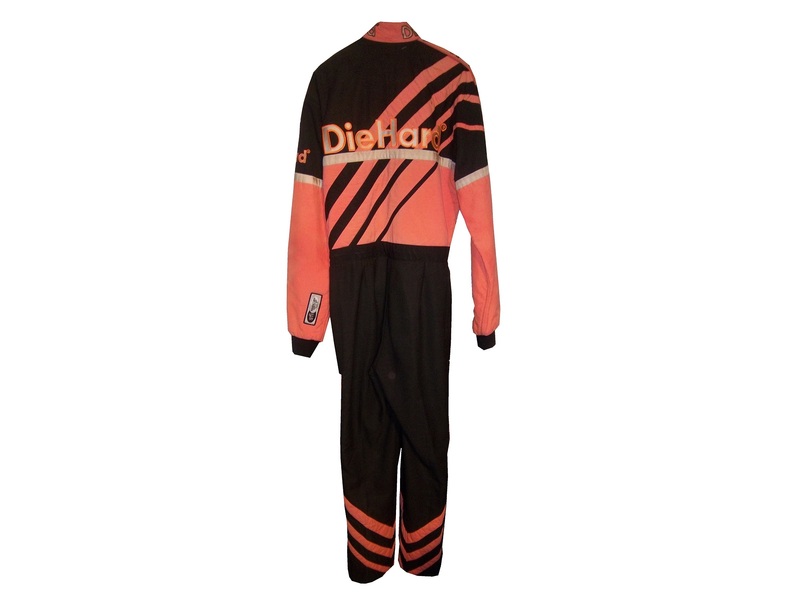 I turned 32 on Thursday, and am celebrating the first year of the The Driver Suit Blog. 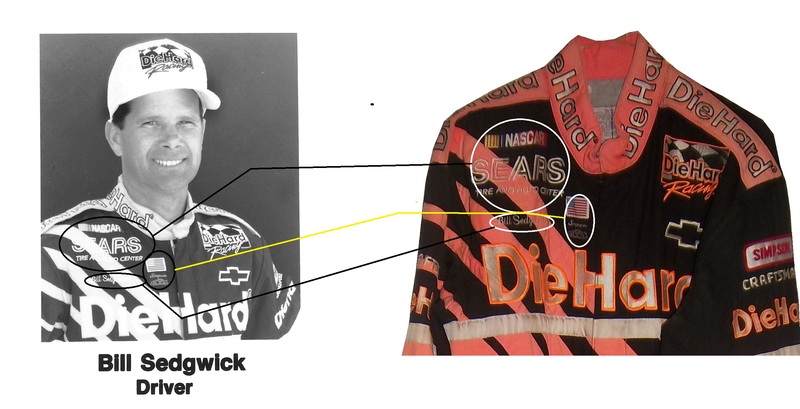 Ok, enough sappy stuff, on to this week’s column.We’ve discussed photo-matching before, but here is something regarding photo matching that many people don’t know about, using press kits to photo match a suit. Press Kits are defined on Wikipedia as “a prepackaged set of promotional materials of a person, company, or organization distributed to the media for promotional use.” In sports, these are usually distributed to the media, prior to the start of the season, and usually contain information about players, statistics on players, history of the teams, photos, and the occasional gift. 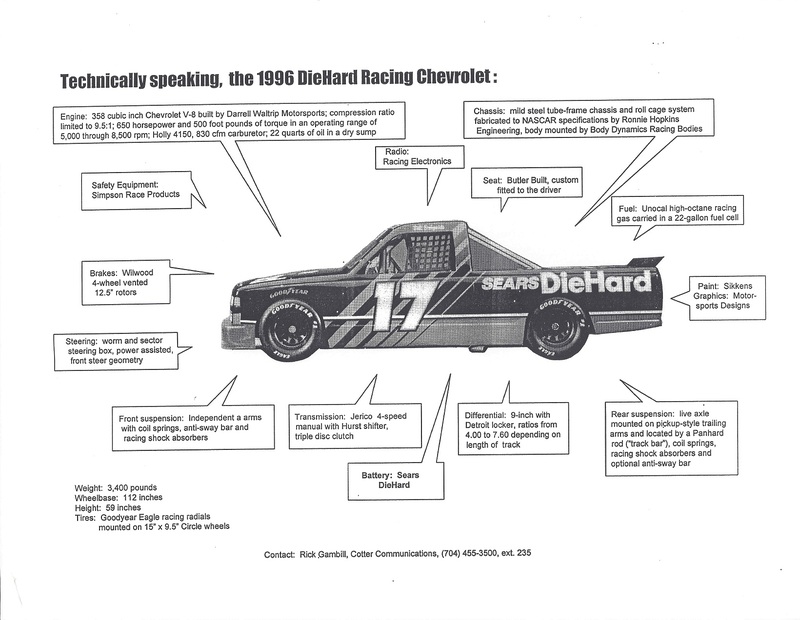 NASCAR teams distribute these to the media before and during the season, and they often find their way into the hands of collectors. 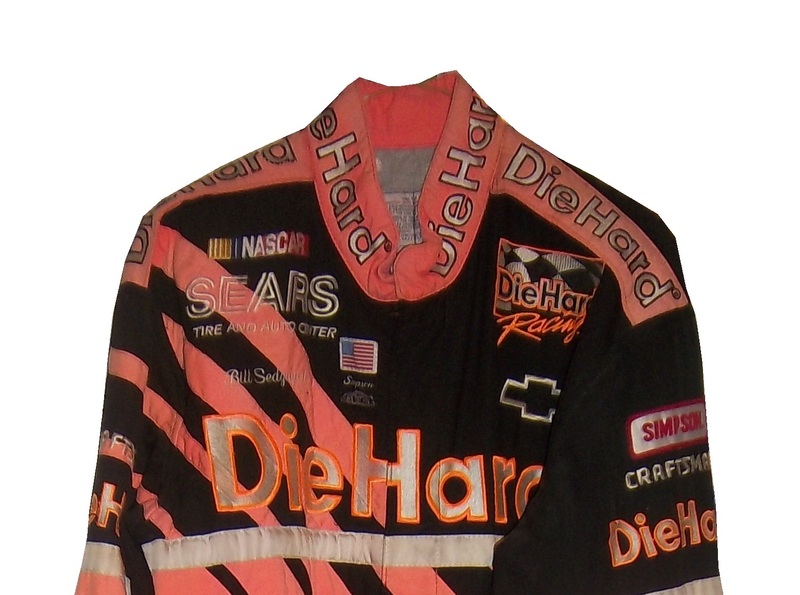 These kits are fun to collect, and I enjoy looking at the various driver suits that the drivers are wearing. These have a serious side in the collectors market, as they can easily be used for photo-matching. 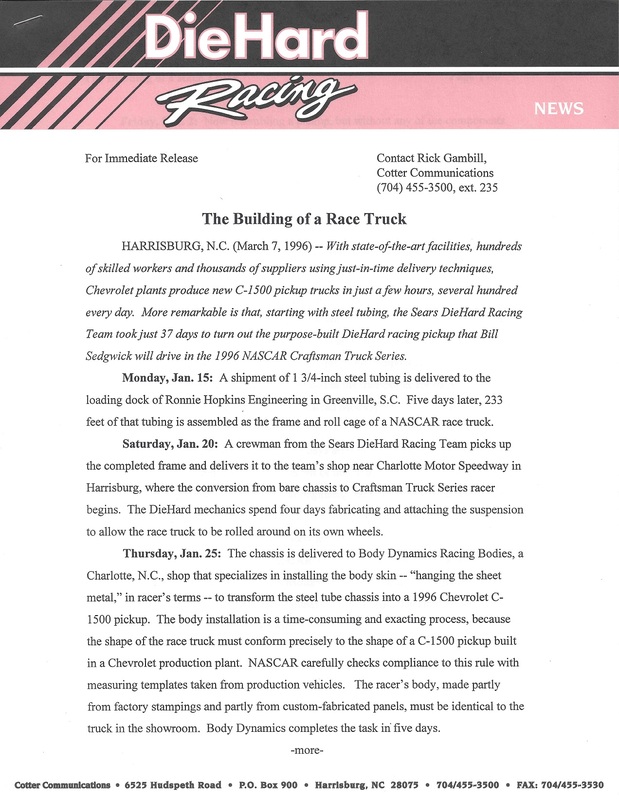 This is an example of a NASCAR press kit, this one from 1996. 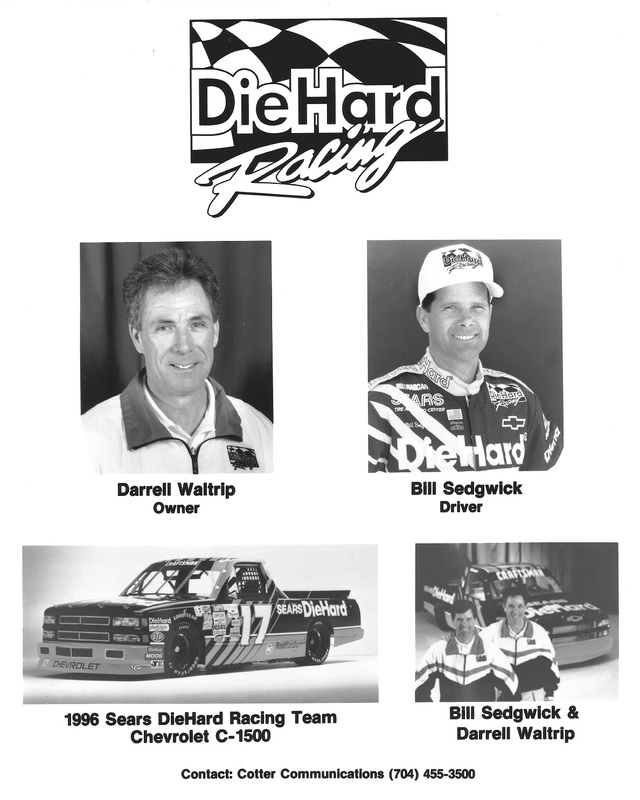 Bill Sedgwick was the driver of the #17 Die Hard Chevy C-1500. 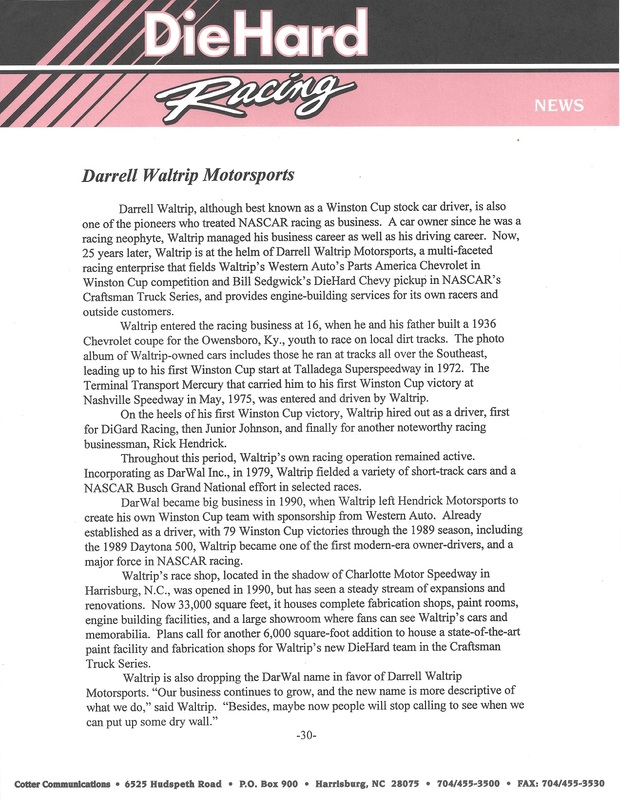 The team was owned by Darrell Waltrip, who also raced for the team in a number of events. 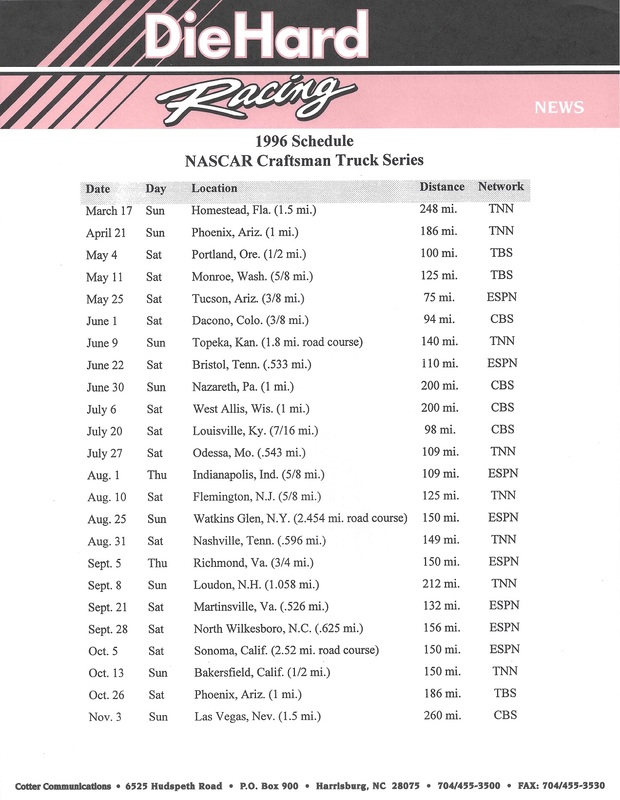 In 1996, he started 23 of the 24 races in the Craftsman Truck Series, and had a decent season, with 3 top 5’s and 8 top 10’s, including a 2nd place finish at Milwaukee. 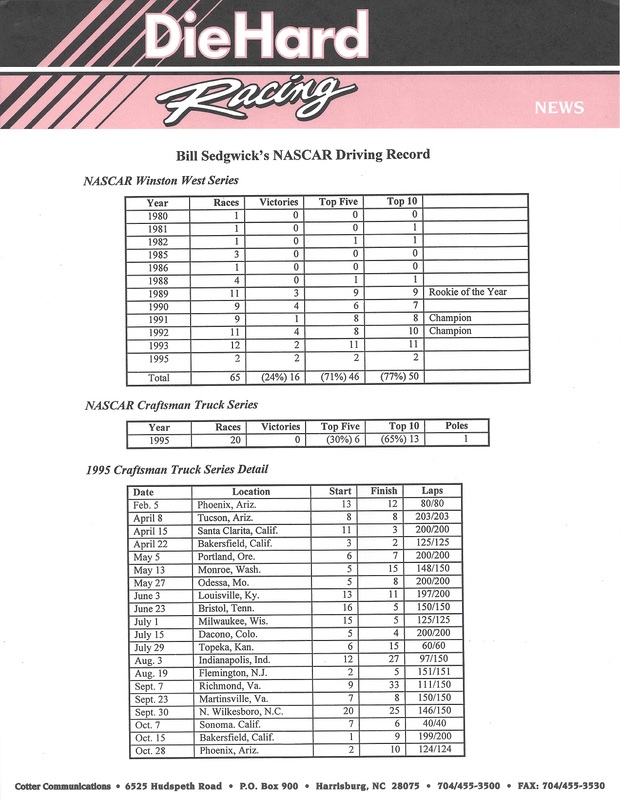 He finished the season in 14th place. 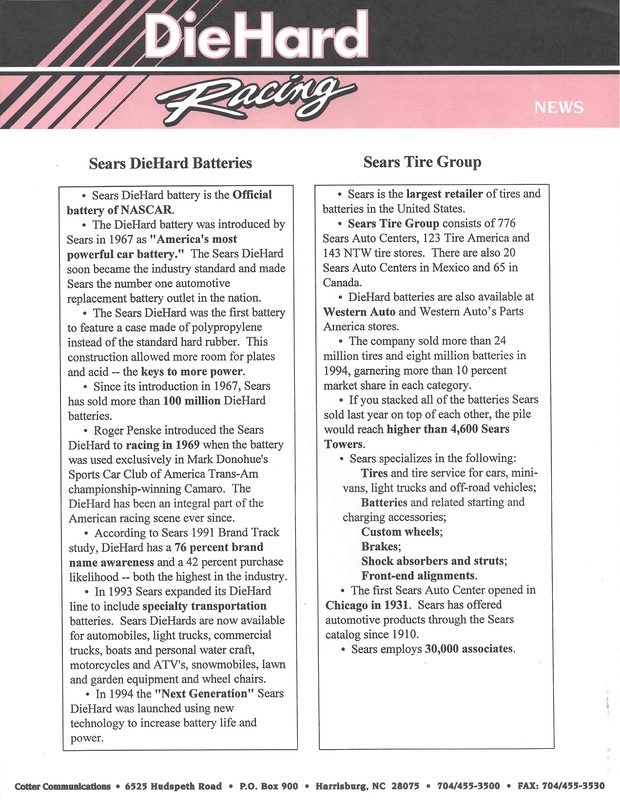 During the season, this press kit was distributed to the media. 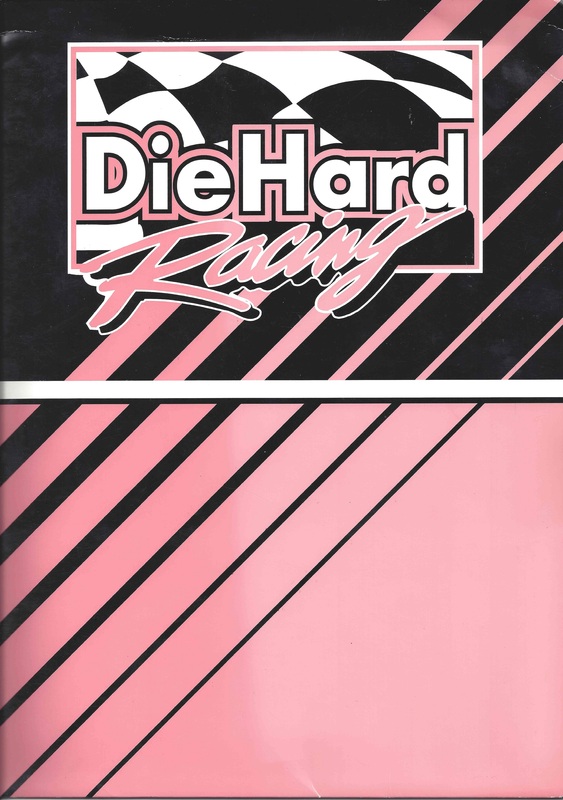 It comes in a custom folder, and contains race statistics a driver profile ,an owner profile ,sponsor information, technical information, a bumper sticker, and a photo of both Darrell and Bill. 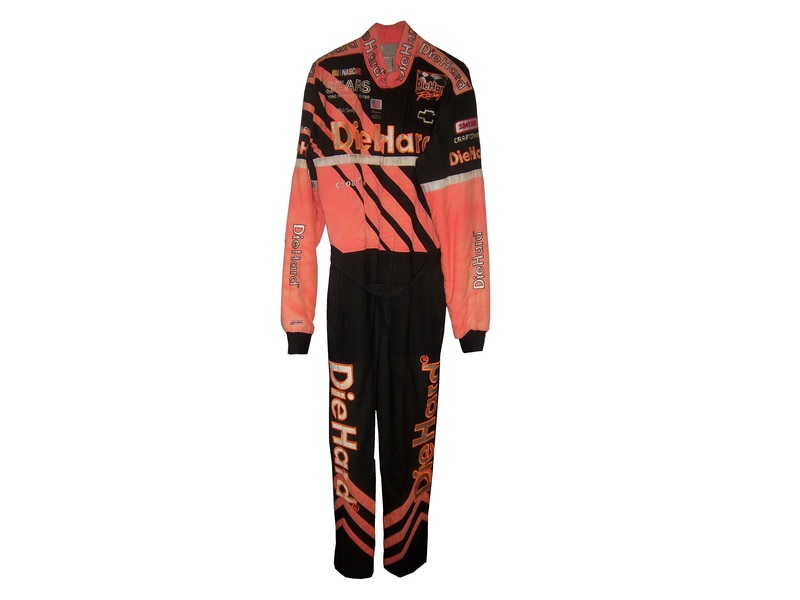 I own Sedgwick’s suit from that season, it was the first driver suit I ever bought. 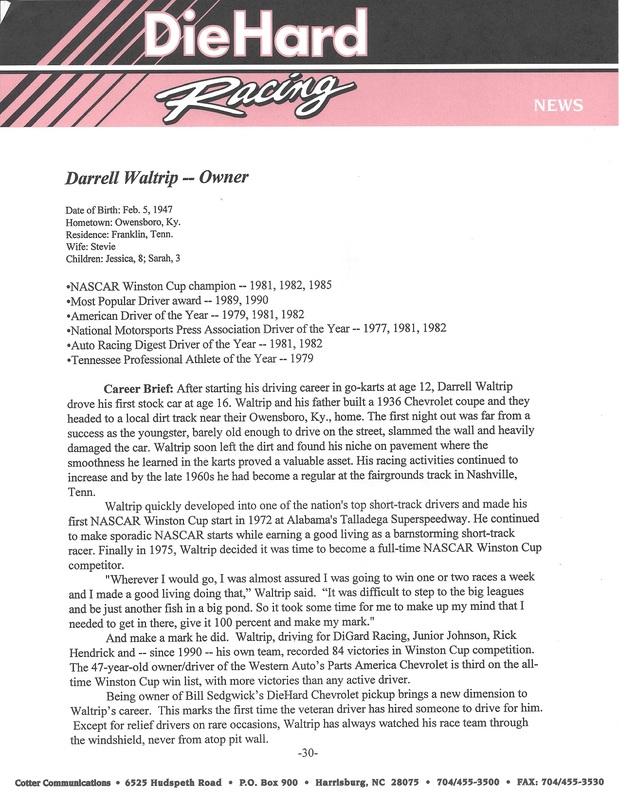 I tried to find a picture of any kind of him wearing the suit, but had no luck, until I found the press kit, and the black and white photo of him wearing the suit. So I bought it and photo matched the suit. Photo-matching, though time-consuming, it is a part of this hobby that is a necessary evil. 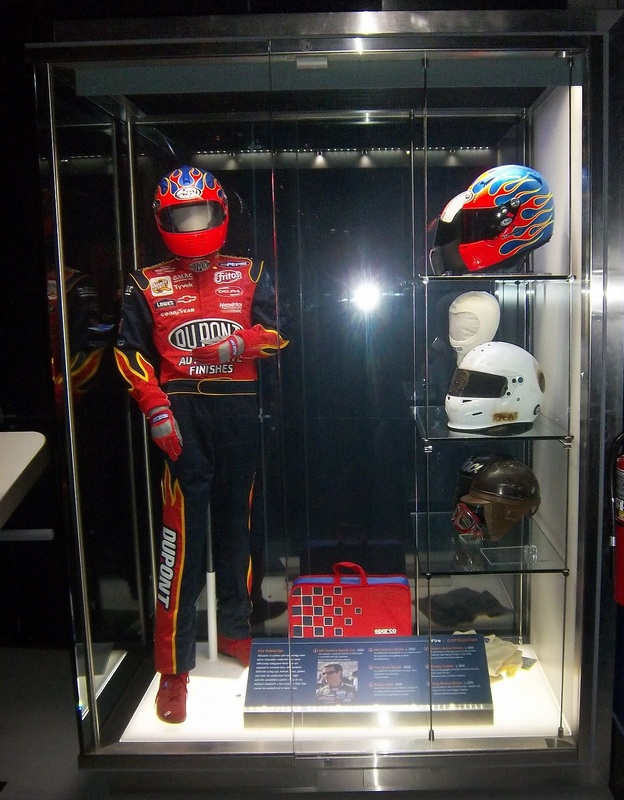 If you buy a driver suit, helmet, or anything else worn by a driver, finding pictures or video of the driver wearing the suit is crucial to authenticating the suit. 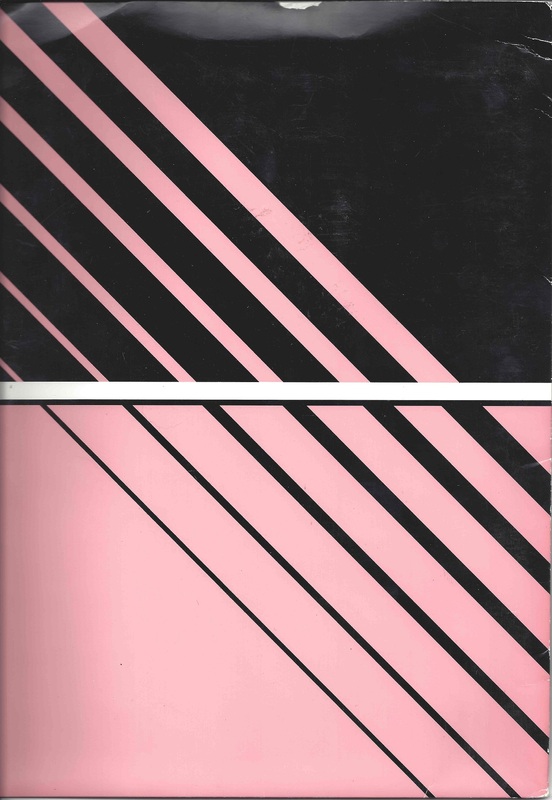 Sometimes traditional manners come up empty, and a press kit is the only way. 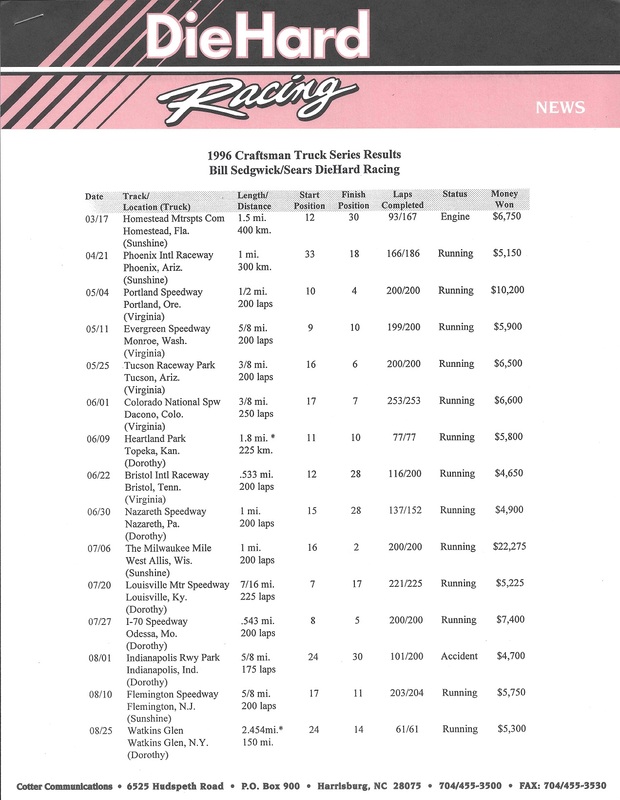 Kits typically run between $5 and $30, so they can be pricy, but the upside to this is that when it works, you have indisputable proof that this suit was worn by the driver in question. 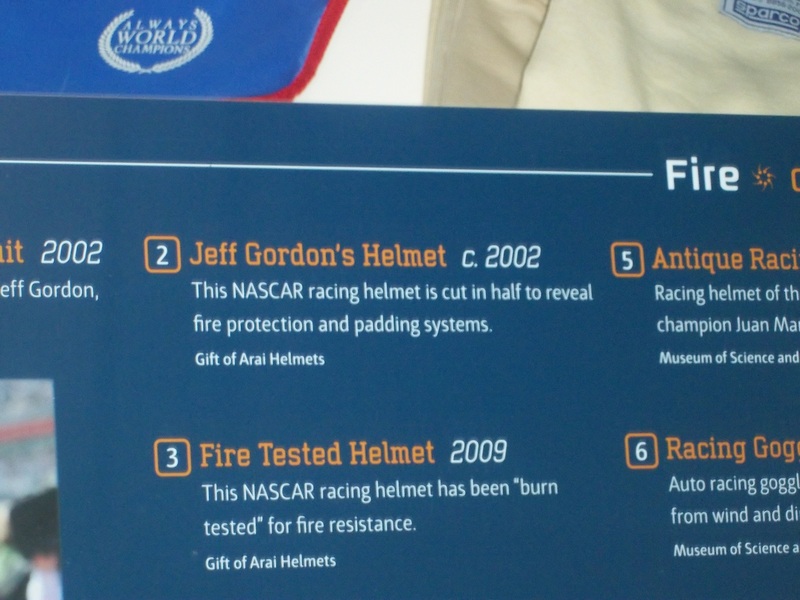 This last year, I took exception with a display at the Museum of Science and Industry concerning an obviously fake helmet that is being passed off as real. I recently went back there after sending my argument that the sign should be changed. 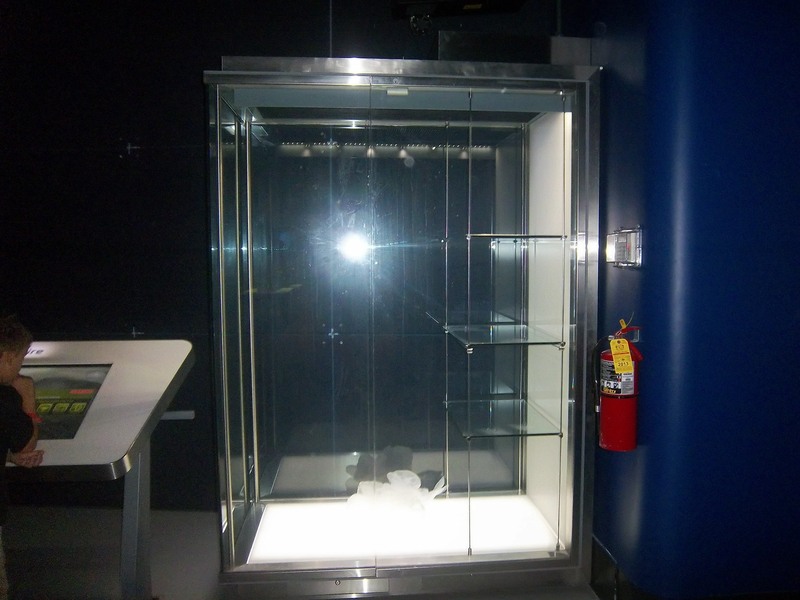 Last time I went the display had been emptied: Recently, I went back and went back to the display, and saw this: The display has been restored, and it looks really good except… THE SIGN HASN’T BEEN CHANGED! I want to love this display, I really do, but I can’t ignore the fact that there is a fake item being represented as real. 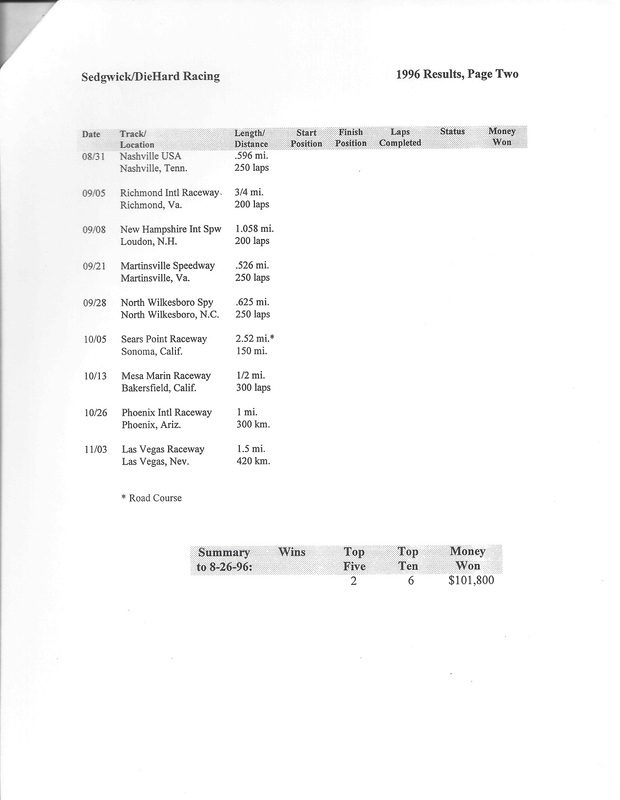 I have seen items from museum collections go up for sale to the public, and I have to make sure a fake item doesn’t get misrepresented as real. Tony Stewart #14 Bass Pro Shop Chevy SS Same scheme as last year, same C- grade. Also, it appears that the last name on the windshield has larger lettering than last year.